At last the earth has tilted her head down enough so we in the Northern Hemisphere can enjoy more sun! Now that I’m in a climate that is more expressive in its way of showing off the seasons, I can appreciate Spring even more. The largely agricultural landscape around St. Cannat has a downy look and is pink with swollen buds. The excitement of burgeoning life reminds me of the opening to Stravinsky’s “Rite of Spring”: tiny bits of disconnected sound that gain power and coherence in a short amount of time. I guess that was what he was after! 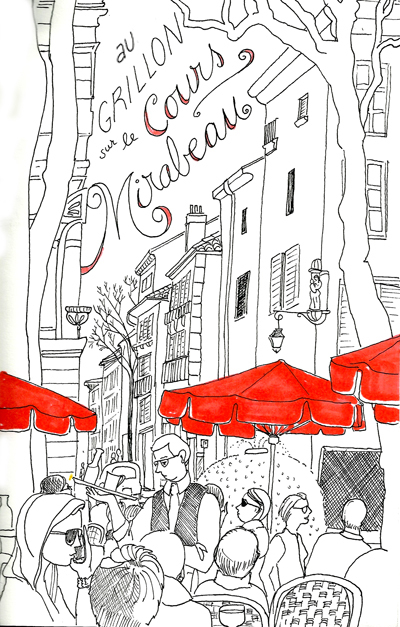 The Cours Mirabeau burst into its own version of blossom with the sudden busy-ness of folks drawn to the outdoors after long months of cold: there were crowds of people in their sunglasses at all the bistros and cafés. I couldn’t resist joining them. I ordered the “Plat Minceur”. Of course, this was not in any way dietetic: in fact I was attracted to the hearty stew with a fat duck leg in it (I spotted the dish being served to a svelte and stylish-looking young french woman) because I was starving. Because the canopy of platanes is still naked, everyone is exposed to sunshine that is, remember, as strong as that of mid-September. I came away not only with a full stomach, but a bit of a sunburn. 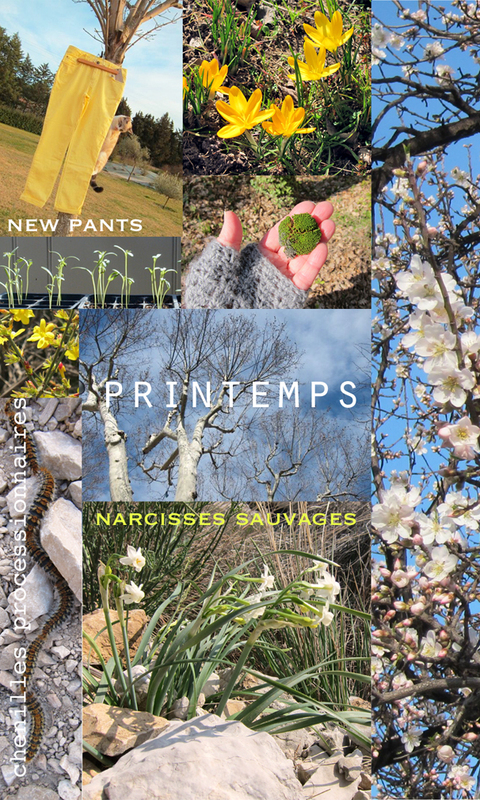 While downtown Aix is bustling with newly emerged Aixois, the surrounding countryside is showing signs of life, from the cultivated forsythia and crocuses to the wild narcissus, which I had never seen before, but found on a hike I took near the Mediterranean. They are more delicate that the kind we force at home. I also saw plenty of the horrifying chenilles processionnaires, which, like our tent caterpillars, wreak hovoc on the trees, but in addition, march across the landscape nose to tail in a long train of writhing fuzz. They will even climb right up your leg and coat in their orderly and disconcerting way! Of course I had to buy some spring-colored pants (it’s still chilly, but one wants one’s sartorial choices to suit the season). I got these lemon-colored ones at Monoprix. It’s funny how, in France, stores like Monoprix, or Casino stock everything—from nice cheeses to underpants. I even bought a vacuum cleaner and food processor at the Geant supermarché Casino!